Have you lost a tooth, or a series of teeth, and wish to regain the beauty and health of your smile? The impact of missing teeth is far greater than cosmetic. Dental implants bring complete restoration to the look and vitality of your smile. Like an iceberg, teeth feature two parts. The visible portion of a tooth, known as the crown, and the hidden portion, known as the root. When a tooth is extracted due to trauma or decay, the visible and invisible portions are removed. This is when many problems arise.Traditionally, dentures are used to restore both the aesthetic and function of missing teeth. Unfortunately, these removable devices don’t provide internal structural support. The result? Bone loss around the missing teeth as your body attempts to respond to teeth absence. Thankfully, advancements in restoration dentistry allows us to fix not only the appearance of your mouth, but also prevent serious complications down the road. Natural Appearance | Using the latest technologies, dental implants look more like your natural teeth than ever before. 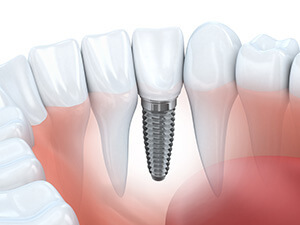 Long-Term Cost Savings | Implants are made to last years. This means less cost associated with temporary dental appliances and more time enjoying your beautiful smile. Reduced Risk of Health Issues | Experience fuller, longer dental health by helping to prevent jaw bone loss and boosting overall oral health. As an active member of the Australian Dental Association, our commitment to the health and beauty of your teeth is unparalleled. Our dentists remain on the forefront of dental technologies. Because of this, we offer the latest dental implants: Straumann, Osstem and Dentium. So what makes these implants so special? #1 | Your unique dental situation. After evaluation, your dentist will help determine the best implant to boost the beauty of your smile and the vitality of your mouth. #2 | Your budget. Once your dentist completes evaluation, you can discuss the best option for your oral and budget health. Complete Restoration in Our Friendly Clinic | Book Now! Dental implants is a major decision. With so many factors to consider, you deserve an experienced, honest and compassionate team to help guide you to the best solution. Smile Gallery Dental Clinic features a team of experienced dentists with over 40 years of combined experience. While there are many dentists in Box Hill, few offer the expertise and unprecedented commitment to your health and beauty. (03) 8595 2632 and schedule your assessment today!